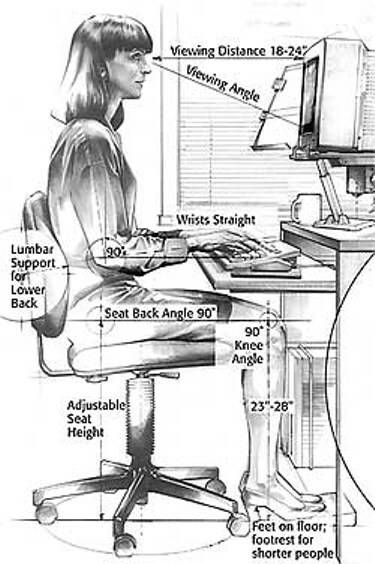 A guide to ergonomics with some Defiance specific tips. Originally posted on the official forums. Are you experiencing pain you think is caused by your gaming? Read on. This guide is designed to get you started on reducing your risk for RSI (repetitive strain injury) while playing Defiance. I will go over some basic concepts of ergonomics, suggest some RL equipment to consider acquiring, and discuss Defiance's weapons with an eye toward reducing RSI exposure. Disclaimer: I am not a physical therapist or a doctor. This advice is compiled from research and my own observations and is not intended as a substitute for professional medical help. While I have done my best to ensure that none of the information in this guide would cause harm if acted upon, you assume all risk for your own actions. I have received no incentive or compensation for mentioning any products listed here. There are many ways in which playing shooters on a PC is advantageous. However, ergonomics is one area where console users may arguably have an advantage. The improper use of a mouse and keyboard can be quite damaging to the body over time, but takes a particular toll on the wrists. If you are experiencing pain in your wrists (or another part of your upper body) that seems to worsen as you game, you may be at risk of developing an RSI. “Repetitive strain injury” is an umbrella term that encompasses a variety of muscle or nervous system injuries that occur as a result of repeated motion (hence the name). In the context of computer usage, the RSI that typically comes to mind carpal tunnel syndrome, which affects your wrist. However, as mentioned above, your shoulders, hands, arms, eyes, and neck are also at risk. While some pain is unavoidable (injections, etc), RSI pain ideally should never happen. Fortunately, there are a variety of relatively easy steps you can take to make your gaming experience more pain free. • When it comes to ergonomics, the old cliche is true: Everyone is different. Ideally, your setup will be yours alone and not shared with anyone who has a different height, limb length, etc. from you. This may not be possible in a home setting, but that’s why good computer furniture (particularly chairs) can be adjusted. • The eyes are flush with the TOP of the monitor. You should be looking at a fairly shallow angle toward your crosshair. Do everything you can to achieve this, for your neck's sake. Laptops tend to fail miserably on this count because the screen must necessarily be joined to the keyboard, whereas the optimal position places the keyboard quite a bit below the monitor. If you use a laptop to game, try mounting it on a stand (which may give you the option to add a cooling fan) and then hooking up a full size monitor via HDMI or VGA. Use window or windowed borderless mode (windowed is what I use and is handy if you can't get good fps at 1080p) to take advantage of both screens if you like to alt tab. Your laptop keyboard is now out of reach, but those are usually not ideal for gaming anyway so connect a USB keyboard (I use the mechanical-switch Cherry G80-3000) and use that. • If you don't want to buy a stand for either your laptop or your monitor and need to elevate them, try phone books or reams of copy paper. Be careful not to put anything heat sensitive under the laptop. • No armrests. Generally I don’t use the armrests on my chair except when I’m fidgeting. • Lumbar support. This is something that gets skimped on with cheap office chairs. There are a wide variety of aftermarket products used to remedy this. One that has worked well on certain chairs for me is the McKenzie SlimLine. However, if you have a nicer chair with built-in lumbar support, these can actually be counterproductive. • Right angles. See all those right angles everywhere? No bending up, down, or sideways. • Keyboard tray. A keyboard tray is what distinguishes a computer desk from a table. It keeps the keyboard and mouse lower than the rest of your equipment. If you try to game at your kitchen table the keyboard will usually be too high, forcing you to stretch your arms out in a way that hurts your entire upper body. • Chair height. If your table/desk is too high, you will need to raise your chair to avoid the aforementioned injury to your hands. If you are short like me, you’ll have to use a footrest. This is not ideal, so if your budget allows, get a new desk that fits you. Make sure you adjust the position/tilt/depth of the seat if possible so you can get those nice right angles. • Keyboard feet (the stubs under your keyboard). These are designed for people who look at the keyboard when they type. The feet make it easier to see the keys. Do not use these if you can touch-type (as most gamers can) as they generally put your hand in an ergonomically inferior position--something that doesn't happen for hunt and peck typers. • Slouching. This affects your back the most and will be the longest battle for most of us. As humans we tend to lean forward when we’re engaged with what we’re doing; this eventually turns into slouching and can be a huge problem for gamers. If you arrange your setup correctly, you can keep it to a minimum. Good lumbar support is essential here. Ergonomic mice are too numerous to list. These include trackball and vertical mice as well as more conventional designs. While any mouse can bill itself as "ergonomic," in general these products are almost all better than the stock device that comes with a computer. My personal mouse is a Logitech G502. Like many newer mice it can be programmed with macros including a simple clicker that makes semi-auto weapons usable again. This provides no advantage beyond what the user’s normal capabilities (you can achieve the same results by clicking fast) but drastically reduces click count. A popular option used by MMORPG players is the Razer Naga, which works well if you like to do a lot of things with your mouse hand. I use wrist braces whenever I’m at my desk, whether for work or gaming. They help me keep my hands in the optimal position for extended periods via the use of steel plates above the wrist and below the palm. While I don’t actually have a diagnosed RSI, I have found them a very effective tool that helped pull me back from the brink of getting one. If you use them in an office setting, be prepared for awkward handshakes and a million “WHAT HAPPENED TO YOUR HAND?” questions. At home, nobody will bother you. As mentioned above, this is probably the most intrusive intervention you can make to counter RSI, but it is also one of the most effective. I’ve tried a few braces and found the Thermoskins to be some of the best. They are made in Australia and relatively inexpensive yet good quality. The only real problem I have is that the plates tend to slide out of their designated places. If you have access to custom fitted braces, that might be worth exploring, but off-the-shelf products have gotten the job done for me. One note about braces—like any other item of clothing, you will perspire in them and they have to be hand washed and dried for maximum longevity, which effectively mandates buying two pairs if you use them heavily or for work. I line the palms of mine with paper towels which I replace every few days. I also spray them down with some mild cleaning solution. This keeps them clean and cuts down on the amount of handwashing I must do. Like other clothes, they also do wear out eventually and require stitching/sewing repairs or replacement. This is a section of particular relevance to Defiance, although the general principles can be applied to most games. The nature of FPS typically dictates that strain on the mouse hand is higher than that on the keyboard hand. So the overarching goal from an ergonomic perspective is to minimize mouse clicks while maximizing damage inflicted. Think of this as “DPC” (damage per click). Given the state of weapon balance currently, I believe that it is quite possible to achieve near-optimal DPS by maximizing DPC. I say "near-optimal" because the primary tradeoff at high levels involves selecting recoil masteries over raw damage-related ones. With DPC as your metric, the best guns are usually those that are fully automatic (one click, hold down the mouse to fire until you empty the mag or release), and have relatively low recoil and bloom (reduces the need for manual bursting as well as compensating via arm movement). Overcharge eliminates both horizontal and vertical recoil, making it a great choice for click reduction as you will only have to worry about bloom while it is active. The damage boost obviously helps as well by allowing you to kill more enemies with fewer bullets; this should always lead to reduced click counts. If your playstyle favors shooting from the hip (SMGs, detonators, etc) you can also cut down on the number of right clicks you have to make. I don't do this fully (usually have an ADS rifle and a hipfire detonator) but you are pursuing a very aggressive RSI reduction strategy it might be worth seeing if you can adapt. TL;DR for Warmaster: Use a high rate automatic weapon before the armor breaks and a Ranger with as high a crit mult as you can get afterwards. Consider the Wolfhound as well, keeping in mind both its very high crit damage and its poor ergonomics. Now to look at specific weapons. Again, our goal is to achieve solid DPS and maximize DPC. FRC Assault Carbine, provided you can get a handle on the recoil via rolls, mods, etc. VBI Thunder and FRC SAW LMGs (and BH, EMC, and EXL variants) - on a SAW, you'll likely want some recoil rolls. High crit pistols such as the Wolfhound. These are highly suspect in terms of ergonomics due to their semi-automatic nature, but excel in a number of niche applications like the WM and other places where you can spam crits. If you use them sparingly you can keep your overall click count down while still reaping the benefits. I am not going to bother discussing BMG shtako or charge blades. This is a fairly obvious one. You want the same bonuses as everyone else, but with an emphasis on cutting down on clicks. Recoil bonuses and masteries become more valuable on many weapons (particularly ARs and LMGs), while fire rate bonuses are slightly gimped. You don’t have to implement these steps all at once. It took me years to create a near-ideal desk setup. Be prepared to experiment with and discard various pieces of gear until you find that “unicorn,” just like in game. Be willing to spend a bit of money if need be, although you can often find good deals on used office furniture. In particular, used corporate-grade office chairs and desks may seem expensive but are generally much better than new, cheaper products. If your budget allows, look for names like Steelcase and Herman Miller—again, going used can save you half or more off the sticker price.